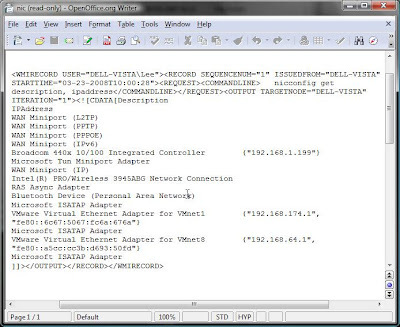 What I didn't cover in that post was WMIC (Windows Management Instrumentation Command). If that previous post was say the equivelent of DOS Kung Fu then WMIC to me is the Ninjitsu of DOS. 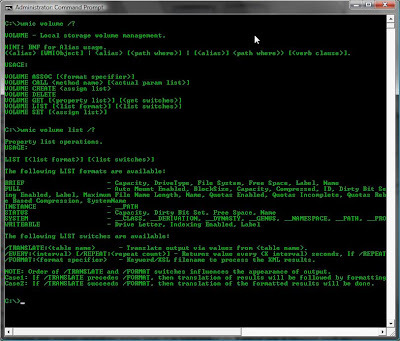 The pupose of this post is to describe and list WMIC commands that can be used to derive information from a target, and that information could be useful to either a Sys Admin, a Malware Hunter or just a plain old Evil Attacker. As I will demonstrate WMIC can be used to modify settings also. Used alongside the commands I listed in my earlier post on Command-Line Kung Fu, the commands listed here allow almost any operation via that simple DOS prompt with no additionally installed tools. WMIC can be used interactively, by simply entering wmic at the command prompt, or non-interactively, by entering wmic followed by a command. I prefere the non-intercative method as it allows me to output to files easier or pipe the commands through a find command to filter my results. I do use the interactive WMIC shell if I'm just browsing around a remote system though as to allows me to set global variables (such as /node) which can be usefull. 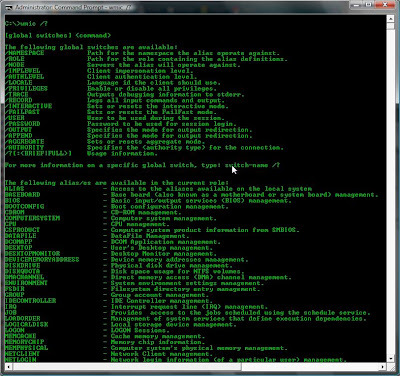 WMIC commands are structured in the following way. To use a global switch I might use the /node switch to query a remote host. 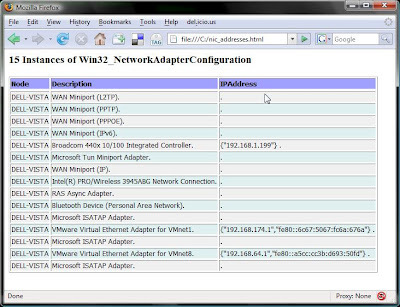 To view a complete list of available WMIC commands and switches simply use wmic /? The results of a WMIC query will by default go to STDOUT (the screen), however these can be output to a file using a couple of different options. wmic share list /format /? If the output is what i want i then simple use the up arrow on the keyboard to repopulate the line and put my format and output file on. Finally one last ouput option I have come across on various websites is using the /record switch. This can only output to xml format but is very useful for recording the command typed, who ran the command, the output and the date. The resulting XML file can then be opened and viewed in Word. Okay, so now I have explianed a few of the basics of WMIC i'll get down to the fun stuff. With that out the way the examples that follow are all run locally. Some Examples I list the command to output to a file, others I will just list the output to screen. This gives me valuable information that the "net user" command doesn't, such as the SID which helps identify those renamed Administrator accounts. This will list both local and global groups. To list the services that are configured to run at startup I might run the following. wmic service list brief | find /i "running | find /i "auto"
Service Packs and Hotfixes -qfe (Quick Fit Engineering) will list which service packs and hot fixes are installed. wmic nteventlog where "Logfilename = 'System'" Call BackupEventLog "c:\systemlog.evt"
Okay, so how might an attacker use WMIC to make forensics more difficult? Well they might erase event logs. When enumerating a target I can use WMIC to produce some output on the targets network settings. The Network card configuration is always useful to have. The command below gives me a nicely formated file with all the network card settings. This will list all the cards and the index numbers. From here I can identify a card and then maybe adjust the settings, dns for example. If hunting malware on a PC I might want to take a good look at what is going to be set to startup. The following command will list all those details and output it to a nicely formatted file. After listing running services and processes as shown earlier an attacker may use WMIC to stop AV software before running his evil program. 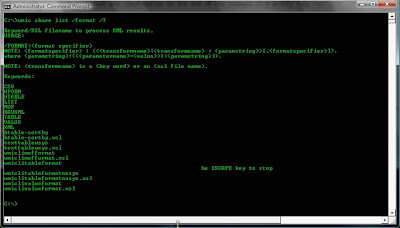 wmic process call create "C:\evilprogram.exe"
wmic service where caption="avast! Antivirus" call changestartmode "Disabled"
I'll update this post with any new interesting things that I find to do using WMIC because i have a feeling I have just scratched the surface here.